By Richard Simkin (1850- 1926). He was a British draughtsman and occasional lithographer of military uniforms. He was employed by the British War Office to design recruiting posters, and to illustrate the Army and Navy Gazette. During his lifetime, he produced thousands of watercolors depicting the uniforms and campaigns of the British Army and also contributed illustrations to numerous publications including the Graphic and others. 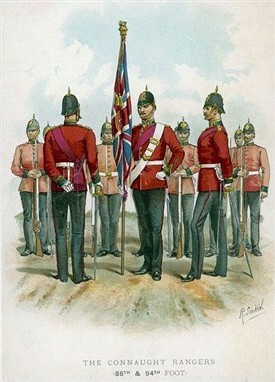 The Connaught Rangers or 88th Foot was raised by the Earl of Clanricard in 1793 as a backup to counteracting the threat from the Napoleonic Wars. It was an Irish regiment ("the Devil's own") yet part of the British Army. 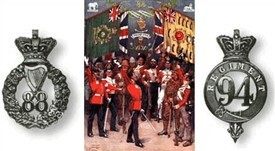 The 94th Regiment of Foot and the 88th Regiment of Foot were amalgamated in 1881 and only disbanded in 1922. This amalgamation was part of the U.K’s government’s reorganization of the British Army. Being one of eight Irish regiments, the Ranger’s recruitments were raised largely in Connaught with its headquarters in Galway. While the whole of Ireland was administered as a separate command within the UK, the Regiment’s Command Quarters were in the Phoenix Park, Dublin. Egypt 1801, India, South America, The Peninsula, The Crimea, Indian Mutiny, South Africa 1877–1882, Egypt 1884–86, South Africa 1899–1902, 1st World War in France and Flanders, Mesopotamia; Macedonia; Gallipoli and Bulgaria were the location of some of their activities. With news of the atrocities committed in Ireland by "The Black and Tans" and with martial law in operation during 1920, five men from C Company of the 1st Battalion stationed in India, decided to protest by refusing to take orders. This spread and a mutiny arose amongst the Irish troops with 69 men being court-martialled. Two men died whilst attacking the armoury, one of them being Peter Sears, (32781 Pte, son of Peter Sears of The Neale, Co Mayo) from the Neale close to Ballinrobe. Fourteen were sentenced to death however, only the leader of the rebellion, Private J. Daly, was finally executed as the army leadership would have realised the extreme provocation to the Irish hearing of the fate of their fellow-Irishmen at home at the hands of British soldiers of another regiment. When the Irish Free State was established in 1922, five regiments which included the Connaught Rangers colours were laid up in a disbandment ceremony at St. George's Hall, Windsor, U.K. These included the regimental flags and captured standards in battle, regarded and respected with almost religious devotion by each regiment and an essential part of army psychology. An older set of colours of the Regiment can be found in St. Nicholas’s Church, Galway along with several memorial stones to fallen members of the regiment. Many of the younger officers, who joined the famous Connaught Rangers rejoined the An Chéad Cath, the Western Command of the new Irish Army. While I have not seen it, in 1966 a stained glass memorial window to the Connaught Rangers was included in the new Galway cathedral. It is a memorial to a regiment, long associated with the west of Ireland, the rolls of which bore the names of many families in Connacht at one time or another, including members of the Cuff-Knox and Tighe Family, Ballinrobe and many more. Outside military circles, the claim to fame of The Connaught Rangers which is best-known worldwide is their singing of their favourite marching song "It's a Long Way to Tipperary"; a music-hall song, written by Jack Judge in 1912. Do you know the names of any people associated with the Connaught Rangers? This page was added by Averil Staunton on 21/02/2012. Thank you. I have his 5 bar Queens South Africa medal and his 2 WW1 medals. I plan to visit Ballinrobe soon. You didn't add my Grandfather John Kelly from Ballinrobe who served in the Connaught ragers from 1888 to 1903 and then from 1914 to 1919. He lived on Glebe Street. Reply: Thank you for letting us know about your Grandfather and we are delighted to have this information. 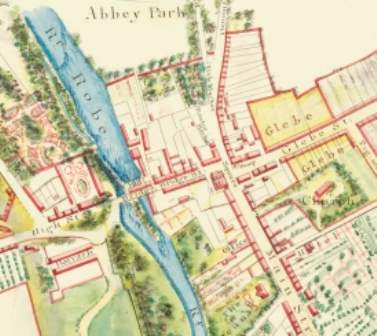 We are depending on people like yourself to let us know the history of Ballinrobe and its Community. Thanks again. Pte John Maughan 5th btn. Addition by Kelly Family: John Kelly from Ballinrobe who served in the Connaught ragers from 1888 to 1903 and then from 1914 to 1919. Those killed served in France & Flanders. Pte John Cassidy died 30/5/1916 enlisted at Ballinrobe. Corporal A. Meenahan wounded during 'rising'.